Palace in the matches I viewed over the break. He has generally lined up in a 4-4-2/4-2-3-1 shape so far with an emphasis on attacking support from midfield. Alex McCarthy has been the number 1 goalkeeper, protected by a centre-back pairing of Scott Dann alongside one of Brede Hangeland or Damien Delaney. On the left side of the defensive line, Pape Souaré has been a constant feature whilst the opposite full-back slot has been occupied by either Joel Ward or Martin Kelly. New big signing Yohan Cabaye has featured in every match so far in the centre of the midfield, largely accompanied by James McArthur too making a very consistent pairing which is key to everything Palace do. On the wings, Palace have seen a combination of Bakary Sako, Wilfried Zaha, Yannick Bolasie and at times Jason Puncheon perform well in largely individual roles. The latter has been found more centrally when the situation allows and from this position, he has a tendency to drift and support collectively. Unlike the other 3 wingers, Puncheon is more oriented towards collective actions such as combinations which allows him to be an influence in central attacks where the others would be less capable. The position at the top of the shape has not yet had a fixed occupier, with Dwight Gayle, Connor Wickham and Glenn Murray (before his move to Bournemouth) all featuring equally. 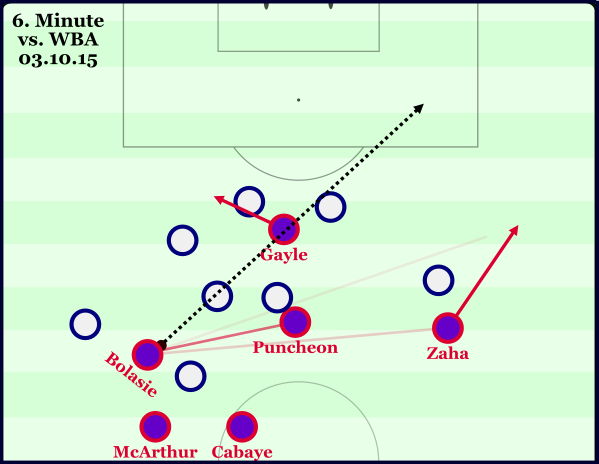 With players such as Wilfried Zaha and Yannick Bolasie, it came as no surprise to see the distinct individuality of Crystal Palace’s possession game in the final third. Combinations are limited to very small scenes, often between a winger, full-back and a drifting forward and even then the intention is to create an isolation for the dribblers to take on. With this, the attacks are quite commonly isolated in small spaces and through more basic mechanisms. This is less so in central areas where, as I stated in the under the previous sub-heading, the attacks aren’t often focused anyway. The input of Jason Puncheon has a telling influence on this as the winger-turned-attacking midfielder works well to bring others into a move with supportive movement and in combinations through the middle. However it must be noted that in possession prior to reaching the penetration phase, Palace are relatively quite strong in their collective possession game. Through Cabaye and McArthur in the centre, they are able to circulate the ball quite effectively through valuable spaces to create a good foundation to build from. It is only once they reach a more advanced position when their orientation shifts significantly. 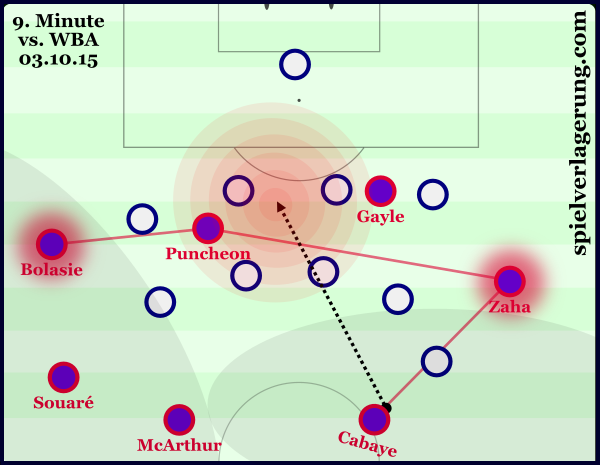 Regain possession – Zaha runs away for isolation whilst Gayle makes diagonal movement for through ball with no intentions of supporting the development of potentially a more effective route to goal. A key problem with a game model so based on individuals is it’s linearity and one-dimensional nature. If a team attacks through individuals and at most, very small groups, they limit themselves in their attacking variability. An attack through one or two players generally contains a limited degree of variation due to the small number of players, integration of space and simple skill-sets amongst other things. When Palace attack through Zaha or Bolasie down the wings, there are only a few options which they can take to break through the defence. On the other hand, with a more collectively-oriented approach, the attacking variability increases significantly. In relation to the limits of individual-based football, an attack which incorporates 5-6 players offers much more potential, as long as it is orchestrated well of course. As long as their is good spacing, the spatial occupation and integration will benefit as the team can circulate the ball together to attack various different spaces. It also allows for a greater combination of different skillsets which also aids the variability. 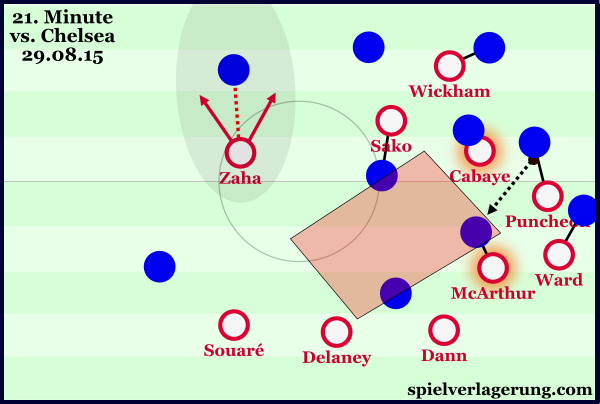 Looking at it on a basic level, an attack involving Zaha and Ward will not be able to effectively solve as many attacking situations as one which also integrates the likes of Puncheon and Cabaye because of the unique (to Zaha and Ward) talents which these two possess. Cabaye on the ball with little support nearby. He is forced to play a long ball which cannot be counterpressed effectively due to lack of connections/pure numbers in the targeted area. One issue in the individuality of Crystal Palace’s possession game is it’s negative influence on collective features. With the aforementioned linearity of individual-focused football, a more collective orientation has a greater impact on various different tactical principles where individuality is less far-reaching. A prime example is positional structure; a collective-oriented tactical concept. As often seen in teams practising Juego de Posicion, a team who has a strong positional structure in possession can defend the transition more effectively as their good structure – something which they play with great emphasis on – facilitates it. When a team such as Palace is so focused on attacking through individuals, they neglect collective features which then has a maladaptive influence on numerous attacking and defensive principles. The wing-orientation of Crystal Palace’s possession game in the final third contributes to the lack of variability in some ways. In attack, the ball spends the majority of the time in spaces close to the touchline with a lack or recognition for areas more centrally. Occasionally the ball-near half-space will be used to provide a degree of support but it is never seen as an important component by the midfield. With all being said, the attacking strategy which Pardew has developed certainly makes the most of his team. In Bolasie and Zaha they have two strong dribblers so it only makes sense for their attacking model to be largely oriented around creating isolation situations for them. It is just a shame that through doing so, Palace are carrying some more wide-reaching tactical deficiencies in their system. In defence, Crystal Palace defend in a relatively compact 4-4-2 block which works well to force the opposition to attack from weak areas. The two forwards have the role of blocking passing lanes into the centre and at times, specially man-marking a key midfielder to take them out of the game as they (and many other teams) did against Chelsea. On the flanks, the wingers are more inside than the usual PL wide midfielder and instead look to support their CM more whilst using their cover shadow well in support of their full-back. They didn’t usually directly challenge their opposing full-back and instead look to show them into a wider position through simple positioning and shadowing of inside players on a diagonal axis. With the recognition of spatial value not being one of many PL team’s strong points, this can easily work against many full-backs who are content to travel with the ball into a weak position before they effectively trap themselves against the touchline. Notably, it differs from a large quantity of PL defences in the final third as the wingers are more oriented to supporting the midfield instead of shifting to a 6-man defensive line as the likes of WBA prefer. This creates for generally a more balanced defensive block where other teams are much more unstable in the centre. An example of Palace’s man-marking causing issues for themselves. Within the man-oriented marking scheme some common defensive weaknesses reside as Pardew’s side commonly become disorganised through the reactivity of the tactic. Fortunately for them, it hasn’t been fully taken advantage of on a very frequent basis though a number of dangerous situations have risen. When defending in wide areas, it isn’t unusual to see the ball-far winger remove themselves from defensive responsibility and be primed to attack the open space on the counter. Because of this, the area vacated by the CMs when they move to the ball for marking duties can be left dangerously open. This is what happened on the right, as both Cabaye and McArthur (highlighted) moved towards the ball to maintain their marking. The space isn’t recovered by Zaha who is looking to exploit Ivanovic for obvious reasons leading to Chelsea making a dangerous combination through the right half-space and centre. Once protecting a lead, it seemed a common reaction for a central attacker to drop into a CM position to create more of an adaptable 4-1-4-1 where the ball-near CM can situationally push back up if needed. With this, the side become slightly more passive and focused on protecting the space between the lines. With their increased passivity, they actually end up sacrificing more space than before and thus in some areas, the block becomes slightly less stable. A good way to check for whether a team is under (or over) performing is to look at their save and shooting percentages. These are relatively simple to calculate; the save percentage is the number of shots on target that are prevented from becoming goals and the shooting percentage is the number of shots on target that become goals. If a team is under (or over) performing these measures, they are likely to return to the league average at some point in the near future. Taking a look at Crystal Palaces save percentage, we can see that they are currently slightly over-performing, preventing 77.8% of the shots on target against them (data from http://objective-football.blogspot.com.es/2015/08/201516-pdo.html). The league average save percentage sits at 69.2% – so this over-performance of 8.6% is likely to cool off at some point in the future. In turn this means that Palace are likely to concede a few more goals, so may have been fortunate with a couple of their wins so far this season being down to a boosted save percentage. On the other hand, if you look at their scoring percentage, they are mildly underperforming at 29.3% vs the league average of 30.8%. Having said that this is pretty close to league average, and the margin is so small here between Palace’s level and the league average that we can realistically say this is at the league average level. This is a good level to be at – but as with all teams they could face either a boost or a drop in this as the season continues, as it’s highly unlikely they stay at the league average level for the next 28 games. Another way to check whether Crystal Palace are over-performing is to look at the quality of shots that they are taking and conceding. To quantify the quality of a shot we can use an “Expected Goal” figure, that uses historical data to plot whether a shot taken from a certain place on the pitch and the probability that a shot from that position results in a goal or not. There are a number of public models available, but this post is using data from Paul Riley’s Expected Goals table – click on the image to be taken to the source. 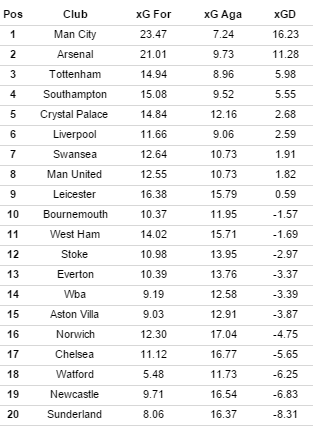 Crystal Palace’s Expected Goals for is 14.84, the sixth highest in the Premier League. Their actual goals total sits at 12 goals for the season, with three of these coming from the penalty spot. This shows a slight level of under-performance in front of goal – which they may get a boost from in the future. For Palace though this level of shot quality is positive, as they are performing similarly to Tottenham (14.94 Expected Goals) and Southampton (15.08 Expected Goals) – two sides likely to be in the top six in May. (Note: Riley’s model buckets shots together in different zones and is not as specific as models like for example. Michael Caley’s. For that reason, it does not take into account that some of Palace’s shots come from fast attacks and counter attacks – where the level of goal expectancy may be even higher). Looking at the quality of shots conceded, Palace sit ninth in the Premier League with a figure of 12.16 Expected Goals against. Compared to their actual goals conceded being 10 (I’m assuming Riley’s model hasn’t taken into account the Leicester game yet) that shows mild over-performance, but nothing too drastic. In the long run their goals conceded will likely align with their Expected Goals Conceded – which will likely come with the drop in their save percentage to the league average level. Taken together, we can get the Expected Goal Difference for Crystal Palace. This is exactly the same as your traditional goal difference, just taken with the Expected Goal figures instead of the actual goal figures. Palace currently sit 5th in the table for Expected Goal Difference, with +2.68. Of course we are only a few games into the season, but this looks good for Palace. Over the course of the season they are likely to score more than they concede – and considering that from Riley’s Expected Goals data only nine teams have a positive Expected Goal Difference, Palace have solid underlying numbers. To conclude, Crystal Palace are the real deal this season. They are conceding slightly less than they should be doing with their above-average save percentage, but they are also conceding shots that are of a lower quality. Going forward they are creating a lot of good chances (despite the three penalties) and potentially they may benefit from a boost in their shooting percentage at some point to keep them in the top eight. Tom is a statistical analyst who co-runs the analytics podcast: Analytics FC.